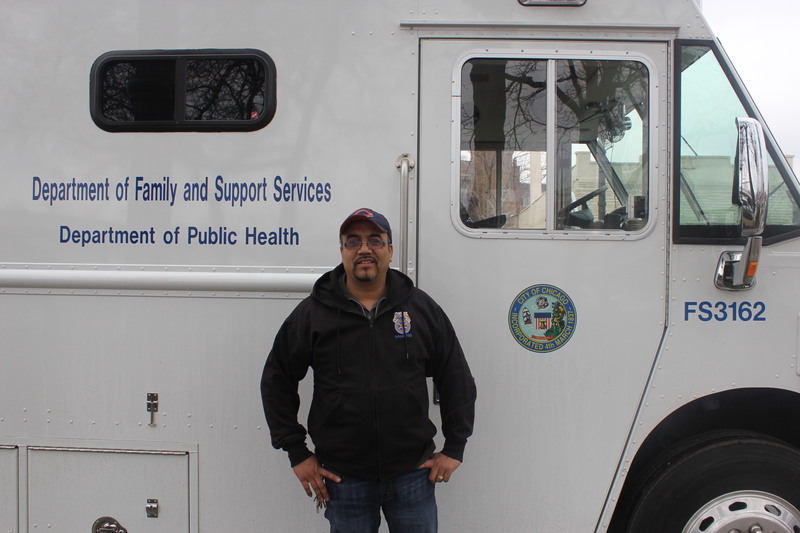 For the past 15 years, Teamsters Local 700 member Marvin Medina has been driving the only mobile clinic that serves the City of Chicago’s homeless population with a full range of free medical and social services. The first mobile clinic was created in 1999 from a joint collaboration between The Chicago Department of Family & Support Services (DFSS) and the Chicago Department of Public Health. The unit is equipped with computers, telephones, restroom and medical equipment and supplies and travels across the city looking for homeless people that need assistance. Besides Marvin as the driver, a case manager and a nurse practitioner are on the mobile unit at all times. The case manager usually leaves the unit to reach out to the homeless in the adjacent areas and transport them back to the mobile unit to be treated. Services provided by the mobile clinic staff include counseling, substance abuse recovery, blood tests and immunizations, and information and referrals. While the amount of people served by the mobile unit varies everyday, Marvin has seen up to 40 people come through in one day. On Fridays, Marvin keeps the truck at the Fleet yard for weekly maintenance. After he refuels the truck with gas, he cleans the inside – wiping down booths, throwing away garbage and used medical tools, mopping the floors, emptying the bathroom sewage – before restocking it with all the necessary medical supplies brought in by the Department of Public Health. In addition to having his CDL, Marvin was also required to obtain a biohazard certification due to working so closely with used medical objects and having to discard human waste. Marvin’s experiences with the mobile unit haven’t all been easy. He once escaped a physical altercation when a man lunged at him with a weapon right outside the truck. “I just tried to diffuse the situation and was extremely lucky that it ended abruptly with no one getting hurt,” said Marvin. On his days off, Marvin works as a mechanic in Evanston for a friend and also enjoys spending time with his wife and three young boys at home. Any Chicago resident who needs shelter, or who knows of a person who is homeless and needs assistance can call 311 to be connected to DFSS Homeless Services and can find out the location of the mobile clinic. DFSS works to promote the independence and well-being of individuals, support families and strengthen neighborhoods by providing direct assistance and administering resources to a network of community-based organizations, social service providers and institutions.